French lentils and red lentils may not be as commonly available in stores as are traditional brown lentils, but they each have distinctly flavorful properties that lend well to a variety of separate dishes. While their nutritional information is not radically different, there are several variations between them that are relevant. Although red and French lentils do not have significant nutritional differences, their physical properties do vary. Red lentils are thinner and more fragile, so they tend to break down quickly in the cooking process. As a result, they’re particularly well-suited for lentil soup and for stews and casseroles. French lentils have a stronger structure and tend to hold their shape better when cooking, so they work well in chilled salads or chili. A standard serving size of any type of lentils is about 1/4 cup of dry beans, which cooks up to approximately 1 cup of soft lentils. In 1/4 cup of dry French lentils, you’ll get 110 calories, no fat, 18 grams of carbs, 4 grams of fiber, 9 grams of protein and 2 grams of natural sugar. The same amount of red lentils provides 170 calories, 1 gram of fat, 28 grams of carbs, 7 grams of fiber, 13 grams of protein and 1 gram of natural sugar. If you're watching your carb intake, you will want to opt for the French lentils. If you are trying to increase your fiber intake, try the red lentils. The recommended daily intake of fiber is between 20 and 30 grams per day, according to Harvard School of Public Health. The 7 grams from red beans contributes a significant amount to your intake. The discrepancy in calorie amounts can be attributed to the fact that red lentils are thinner than French lentils, so you can fit more of them in the same 1/4 cup measure. Aside from their slight differences in calorie, carb and protein values, red and French lentils have very similar health benefits. Both are protein-rich, plant-based foods, which gives them a unique set of positive nutritional properties. According to ChooseMyPlate.gov, for example, low-fat proteins such as lentils are essential for growing, building, repairing and maintaining tissues in blood, skin, bone and muscle cells. Protein is also a particularly satiating nutrient and may be able to keep you full for longer than carb- or fat-rich foods, which can be important if you’re watching your weight. Finally, both red and French lentils are high in dietary fiber. According to Harvard School of Public Health, that means they can improve digestive health and potentially lower levels of blood cholesterol and blood sugar. The choice between red and French lentils is simply a matter of personal preference, since both have outstanding nutritional profiles and are excellent sources of protein and fiber. To meet all of your nutritional needs and follow the healthiest eating plan possible, however, diversify your protein sources and supplement your diet with fruits, veggies and whole grains. 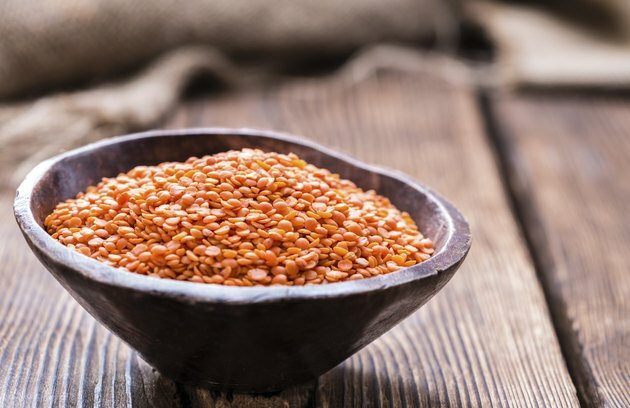 What Are the Benefits of Red Lentils for Fatness?